This one asks just two questions to determine how your Net Worth ‘stacks up’ against others, by age and by income. Again, the obvious question is: how much SHOULD I have accumulated in my net worth? Step 1: $250k is roughly $385,000 by the time I reach 60 … a simple estimate of adding 50% every 10 years to allow (very roughly) for 4% inflation gets close enough to the same result without using an online calculator or spreadsheet. Step 2: So, if I want to keep the same standard of living – with all the arguable pluses and minuses of grown up kids and greater health and insurance costs … not to mention more green fees 😉 – I’ll need to generate a passive income of at least $385k that, according to our Rule of 20 (which assumes a 5% ‘safe’ withdrawal rate), means we need $7.7 Mill. sitting in the bank (well, in something that will give us a RELIABLE 10%+ annual return). Step 3: If I plug my starting Net Worth (let’s go for the generous starting average for people on my super-generous assumed current income) into this online annual compound growth rate calculator, I can see that I need just over a 19% average annual compound growth rate between now and then. – What average investment returns I’ve managed to achieve in that time. Well, I’ve been working for about 27 years, and I started full-time work with about $6k of car and pretty much nothing in the bank. 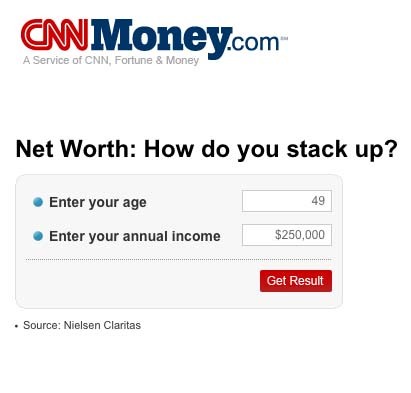 So, if I plug in my current net worth (again, assuming that it’s what CNN Money says is ‘average’ for my super-high assumed income); what I started with; and 27 years between the two … the calculator shows that I must have averaged 21%, so no problem! So, if I assume an average compounded investment return (e.g. stock market) of 12% for the past 27 years … which seems pretty darn generous, if you ask me … then, I would have needed to be smart enough to save nearly 40% of each pay packet for the entire 27 years (including putting some of it … a lot, I suspect … in my home). Running that forward (assuming a more sedate, and probably much more likely, 5% salary increase each year until I retire at 60) and I CAN reach my Number! In fact, I overshoot by about $1 mill., so I can even afford to drop my regular savings rate to ‘just’ 35% of my before-tax pay packet … easy, huh?! 4. Even after all of that, I still NEED to work until I’m 60! Last week, I posed the question: how much should you have saved by now? b) they fail to take into account that YOU need to have saved enough to ensure that you’ve reached Your Number by Your Date. Your ‘desired nest egg’ – in this calculator – isn’t variable … it’s One Million … that’s it! My issue is that plenty of people (fortunately, none of them readers of this blog) – with the support of an ‘authority’ such as CNN Money – still think that $1,000,000 is something to aspire to! PS I’m sure there’s plenty of other online calculators that will do the job, although I couldn’t find one that accepts >20% annual return and we know that we need more than that! If you find a good one, please post a link in the comments. Now, that’s hard to bottle! Over a couple of posts, I posed the question: is your partner worth $5 mill.? Through some suspect mathematics, I ‘proved’ that partners aren’t worth the price you have to pay (in lost equity) UNLESS they are the ones with The Big Idea! (b) spotting winners i.e. good potential people who can help him make them happen. This is rapidly appearing to become a blog about your Number … of course, that’s not the case: it’s a blog about money, specifically about how to make $7 million in 7 years, but you can pretty quickly see that having a real financial goal in mind is a powerful focusing tool. It’s also a ‘comparator’ – a tool to use whenever you are presented with two financial alternatives … for example, Scott who is deciding how many clinics to open: 1, 2, or 3+ [Hint: only one of these is the right answer, and it’s not the obvious one!] … it was ONLY by having a clear understanding of his Number / Date that he came to this conclusion. Without that understanding, Scott could have made a terrible (OK, far better than terrible … more, non-optimum) decision that would have had the opposite effect to that intended: it would have committed him to working for 10 to 20 more years. So, now that I have provided the hint, let’s look at today’s conundrum, posed by Money Magazine in March 2008: how much money should you have saved by now? Can you see the obvious problem? Well, it assumes that I am going to want to keep working for another 15+ years! 3. Subtract your Current Net Worth from 1. 5. Divide 4. into 3. That’s how much you need to have saved each year between now and your Date, if you want to reach your Number. Now, you can get fancy and use an online compounding calculator to do the year-upon-year calculations, but this is a good place to start.